ALTAMONT – Jeanne M. Stewart, 60, of Altamont, passed away Friday, September 6, 2013 at Samaritan Hospital in Troy after a long courageous battle with early onset Alzheimer’s. Jeanne was born in Albany, the daughter of the late Bernard and Helen Vincent Polinsky, and she lived in the area all her life. She was a graduate of Vincentian Institute in Albany, and earned two degrees from Hudson Valley Community College. She was a registered nurse specializing in pediatrics, and was employed for twelve years by Dr. Allan MacCollam in Guilderland. She also was employed by the Albany County Health Dept. in Cohoes, was Assistant Director of Nursing at St. Margaret’s Home in Albany and the Eddy Heritage House, and was employed at St. Colman’s Home in Watervliet. 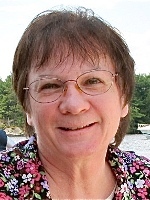 She loved boating with her family on Lake Champlain, Sacandaga Reservoir, the Mohawk River, and Lake George, and was a member of the Harris Bay Yacht Club on Lake George, and a former member of the Crescent Boat Club on the Mohawk River. Jeanne dedicated her life to being a loving wife, a devoted mother, and caregiver for her mother for ten years prior to her mother’s death. Jeanne is survived by her husband Bruce Stewart; her son Joseph A. Stewart of Altamont; her sisters Mary Achcet of Amsterdam, Kathy Sheehy (Neil) of Glenville, and Karen Sue Caprood (Philip) of Colonie; and by several nieces and nephews. She was predeceased by her sister Anne Polinsky. Please note changes: A Mass of Christian Burial will be celebrated Tuesday morning at 9:00 in All Saints Catholic Church, Homestead Street, Albany. Relatives and friends are invited, and may call at the Hans Funeral Home, 1088 Western Ave., Albany, Monday from 4-7pm. Interment will be in the Gerald B. H. Solomon Saratoga National Cemetery on Tuesday at 1:30pm. In lieu of flowers, the family suggests memorial contributions to the Alzheimer’s Association Northeastern New York, 4 Pine West Plaza, Suite 405, Albany, NY 12205. To leave a message of condolence for the family, send a sympathy card, or obtain directions to the funeral home, please visit www.HansFuneralHome.com. I’m so sorry to hear about your dear wife. Please accept my sincere condolences on her passing, and know that you and your family are in my thoughts and prayers. Please accept my heartfelt condolences on your loss. Jeanne was such a sweetheart and I will miss her. The memory of Jeanne will always be a cherished one by our family. Jeanne was a great sister and a treasured friend. She meant so much to our children Colleen and Christy. She was the life of every holiday party. She took such beautiful care of mom along with the rest of us. As a pediatric nurse, she was an enormous support system. She took great pride in her work and dignified the lives of all who knew her. We had so much fun throughout the years and could always count on a laugh when we were with her. She had such a sense of humor. She chose me to be the godmother of her son, a role I took seriously and enjoyed very much. We have such fun memories of summers with Joe and the swim club. We loved being with all of you on the “yacket” as she called your boat. She was so happy on the boat that we were glad to be part of the “show”. Bruce as “Captain” had all the details down knowing the exact routes to take, monitoring the weather and lake floor so that we would have a smooth, safe adventure. Jeanne has left us at such a young age, but will always be with us in spirit. I am thankful to have had her for my sister and friend and aunt to our children. So sorry to hear Jeannie has passed. We always enjoyed her company at the club. We know it has been tough. God Bless. I remember during my childhood Aunt Jeanne, or “Aunt GeeGee” as we called her, coming over and telling jokes around our kitchen table. I would look so forward to her visits as she was such a fun person – making all of us laugh until our stomachs hurt. Then during my teenage years, Joe would come and swim with us every summer and Jeanne would come many nights and the two of them were practically stand up comedians. I loved these visits and will always remember them when I think of Aunt Jeanne. Our thoughts are with you and your family. We know how devoted you were to your mother and we are so sorry for your loss. Your wife and mother’s passing came to me as such a painful surprise this morning and I mourn the loss you are both experiencing. In my eyes, she was still such a young woman. However, I am painfully familiar with the Alzheimer’s experience you were all undergoing and the challenges you all endured with that tragic strike, having undergone it with my father for so many years. May God bless you both as you struggle with the pain of her loss and help you both to revel in the countless positive memories you all built together. Doug and I were so sorry to hear of your Jeanne passing. I’m sorry we were unable to attended her services. Our thoughts and prayers are with all of you. Bruce, I was saddend to hear of Jeanne’s passing, words cannot say enough at a ttime like this, but your in my thoughts and prayers. Rest in Peace Jeanne, Godspeed..
We enjoyed Jeanne’s beautiful smile, infectious laugh and sense of humor~ she was a real joy to be around, we are proud to have had the pleasure of knowing her…..sorry for your loss! I am so truly sorry to hear of Jeanne’s passing. I rec’d a note from Kathy about our mom who died recently of late onset Alzheimers. She had started around 80 and died at 90. I am not sure how my sister Mary found out but were are all shocked to hear about Jeanne. Our thoughts (Carol, Sue & Mary) are with you and your entire family. We hadnt seen her in years but it looked like she was enjoying life to the fullest . I am sure you have many wonderful memories to remember her by. Our thoughts and prayers are with you all. Love, Carol & the Devine cousins.